Congratulations! You've made it to the last chapter of our seemingly everlasting narrative! To conclude our time in Basel, we attempted to board an earlier train to Paris than the one for which we had a ticket. I repacked all of our many things, including the items we'd picked up as souvenirs along the way, and they somehow still managed to fit in our bags. I'm still not sure how that worked, because I'm pretty sure I left the US with no room to spare. Once packed, I fed Elise, changed her diaper, got her into all her outdoor gear, strapped her in the stroller, attached everything else to various parts of my body, and we left the hotel. Since Chaz was going to be checking out the next day, we left our key in the room so that he could return it (along with his own key) at that point. We arrived at the train station with plenty of time to spare, so we picked up a pretzel and some water to keep us well fed and hydrated on the train. When we got to the track, I figured it'd be best to confirm that getting on an earlier train was fine. Would it have been fine? Yes. Would it have been free? NO. The conductor informed me it would be an extra $131 (USD), and we suddenly had an extra four hours to kill with all of our luggage...over nap time. What a development. Back to the hotel we went. Suddenly leaving the key in the room seemed like a terrible idea, but when you're laden with a tiny human and bags hanging off of most of your appendages, the front desk people don't ask too many questions when you say you left your key in the room. I had intended to go to the (utterly wonderful) Swiss grocery store once more in those four hours, but instead it turned into a nap fest. Elise decided sleeping with her feet on me was the most comfortable position. She got a good rest and then we washed, rinsed, and repeated the same process again for the second time. The silver lining here was that Rachael was now on the same train! Hip hip hooray! Three hours and sixteen minutes later we found ourselves back in Paris, ready to catch our flight home the next day. But since we WERE in Paris, we immediately knew we needed to make the most of our remaining couple of hours. Take in the final sights. Our train had arrived at 7:45 pm, so by the time we were setting out from the hotel it was 8:45. First stop: crêpes. Oh my goodness. 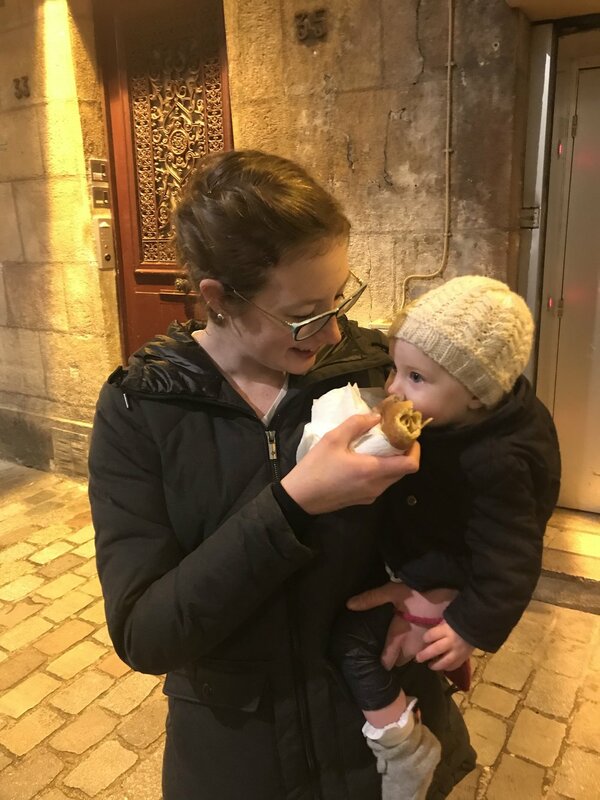 We found the BEST crêpe place in le Marais, which is, in my humble opinion, the loveliest historic district in the city. It's also a safe place for two women and a baby to be walking around at night, so win-win. But the CRÉPES. If you're in Paris, you must go to La Droguerie. You must! Rachael and I each got two crêpes - one savory (for dinner, of course) and one sweet. I shared my apple-filled crêpe with Elise, and she LOVED it. Each time I offered it to her, she'd try to take a bigger bite, and once it was in her mouth she wouldn't let go. If the baby approves, you know you've got a good thing going. With filled bellies, we made our way back to the metro and raced toward Ladurée on the Champs-Élysées. They closed at 11 and we walked in at 10:59. The ladies at the counter begrudgingly filled our macaron order and rather smugly turned away the man that walked in at 11:00, but no amount of near-closing-time attitude could stifle our anticipation over the imminent macaron consumption. I'm happy to report that they exceeded our expectations. With our final stop of the night complete, we felt like we'd hit everything we needed to and went back to the hotel feeling content and ready to head home in the morning. Our flight was at 11:30 am, so we decided we'd leave at 9:00 to give ourselves plenty of time to get to the airport. Please note: we each received an email informing us that there was a Nor'easter scheduled to hit Boston at the same time as our flight, and that we should be prepared for a delay. This email also mentioned that we could make one free change to our flight plans, but we figured we'd use that in case we got stuck in Reykjavik due to our Boston flight being canceled. What we did not anticipate was leaving half an hour late and that it took roughly 1.5 hours to get from our hotel to the airport, thanks to rush hour traffic. If you're wondering how we still made our flight...great question. WE DIDN'T. Up until that point, I had never missed a flight in my life. I think if it had been any other flight, I would have been out the full airfare for rebooking my ticket, but guess what came in handy? The email! We cashed in on that one free flight change and voila! Rachael, Elise, and I now had a whole extra day in Paris. Considering chances were extremely high that our Reykjavik to Boston flight was going to be canceled anyway (and we later found out that it was), the missed flight was rather fortuitous. You've certainly heard the "when life hands you lemons" saying. I'm going to raise you one and say that when life hands you lemons, you occasionally get the chance to practice alchemy and not only make lemonade, but convert your yellow lemons to yellow gold and live it up to the hilt. We chose this opportunity to take that route and I'm pretty sure our spontaneous extra day was the very best. First, we found a hotel for the night. 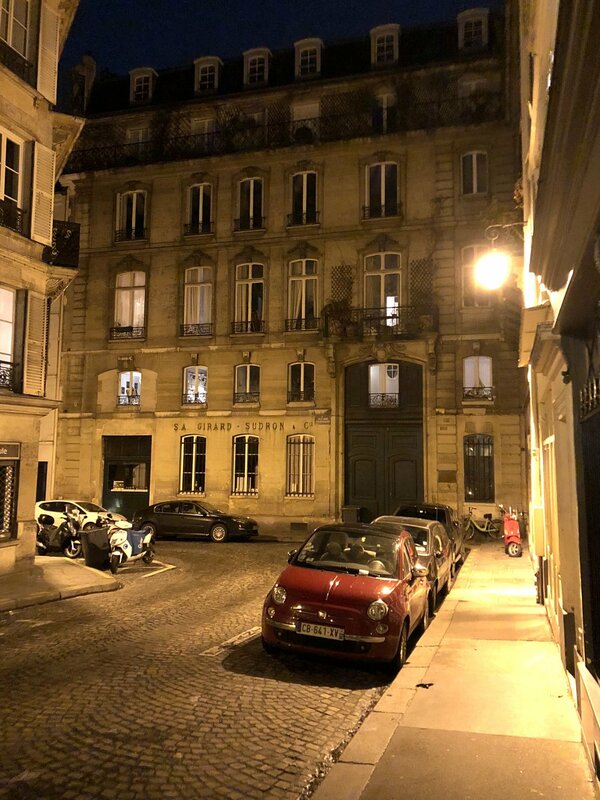 We picked the location carefully - le Marais! More crêpes for us! Our room had the most perfect window, and with the slightly warmer temperature and sunny day, we left it open to provide us with some fresh air. We dropped off all of our stuff (another award to Rachael for seriously saving me when it came to hoisting Elise, the stroller, and my suitcase up several flights of stairs between the airport and the hotel), regrouped a bit, and then went in search of lunch. Elise made sure to practice some conducting before we set off. We hit the road and discovered that the Rue de Rivoli is basically the affordable version of the Champs-Élysées. The result? A shopping excursion! We made a bee line for H&M thanks to the fact that while I was perfectly fine wearing the same pants and shirt again for an extra travel day, there are other articles of clothing that I was definitely NOT ok rewearing. Hence the need for a dependable, cheap store with all the...basics. Along the way we stopped for lunch at a patisserie simply called "Paul." In spite of the simple name, our three-cheese flatbread pizza and chocolate cake were anything but simple, and we walked out feeling rather sprightly and well-fed. We also stumbled across a grand cathedral and used it both as an opportunity for prayers and photos. One of those things felt significantly more holy than the other. In retrospect, we should have stayed inside the cathedral and said more prayers, because shortly after departing we got caught in a heavy downpour. Perhaps that was God's casual smiting for taking a few too many photos. We ran the last couple of blocks toward H&M and shook off the few raindrops that hadn't already soaked into our clothes, which led to the discovery that Elise had made great use of the rain as a distraction for removing and disposing of her hat. It was gone forever, sadly, but H&M thwarted her dreams of remaining hatless as we left with a new one in hand. Or rather...on her head. After a couple more stops, I realized that if we had any hope of being able to sit down for dinner that night Elise would need a nap, so we made our way back to the hotel. Baby naps have their perks - time to search for the perfect dinner place! 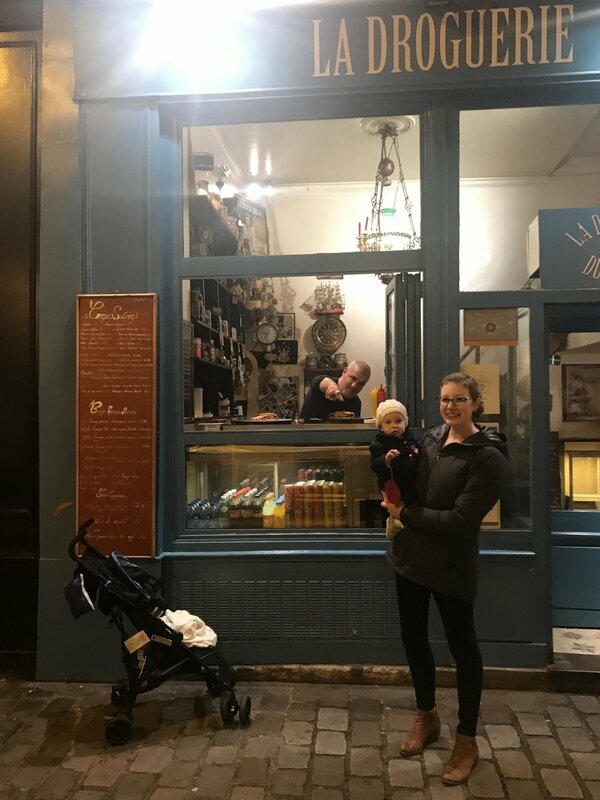 A quick Google inquiry for best (affordable) restaurants in le Marais led us to Le Colimaçon, and this is where our extra day went from simply lovely to totally awesome. It turned out to literally be the BEST MEAL. As in best meal I've ever eaten in my entire life, and possibly the best meal I hope to consume for the rest of my life. I knew Paris had good food, but this was above and beyond. Because we were looking for restaurants in the neighborhood we were staying, we were able to walk. It had warmed up a bit over the course of the trip, so it might be more accurate to say we strolled. I mean, we did have a stroller, so we definitely strolled. The sights were perfectly Parisian, and for a brief moment I wondered if I'd accidentally walked onto the set of Roman Holiday. I then mentally reprimanded myself for that thought seeing as Roman Holiday is set in Rome. It was far too late in the trip to blame jet lag. Baby sleep, perhaps? We arrived at the restaurant and were almost turned away because we hadn't made a reservation. At the last moment - the very last, since we had already walked out the door - the waitress ran after us and informed us that someone had reserved a table for six, but only four attended, so a table was available! It was a tiny dining room that felt friendly and intimate in a way that only the French can pull off. 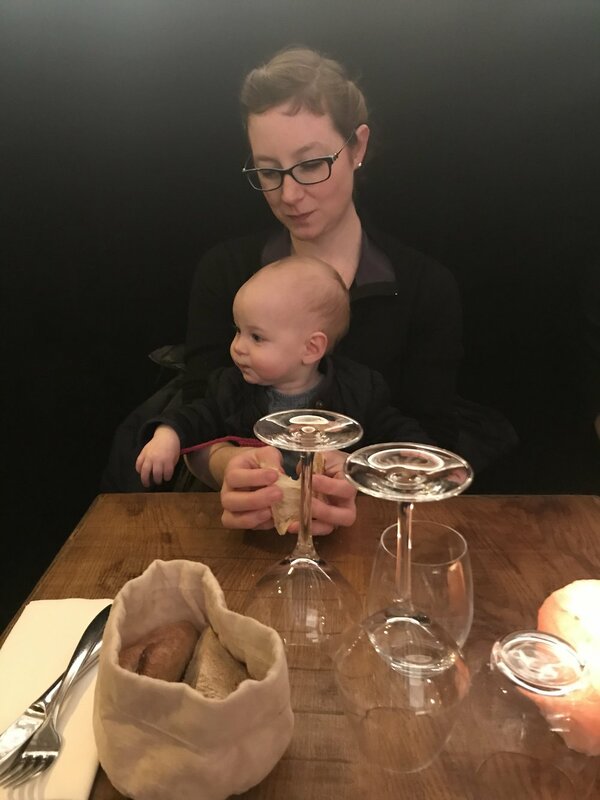 Elise must have inhaled the classiness of the place and translated it into feeling compliant, because she sat in my lap and chattered quietly while gnawing on a piece of bread as opposed to her normal decibel level for talking in quiet places. That level is off the charts and is typically reserved for church. In case you need proof, here's a shot of both of stuffing our faces with a shared piece of bread prior to the arrival of the main course. We didn't take any pictures of the actual food because it was too glorious to behold and might have broken our cameras. Also because we dug into it so fast that we didn't think to whip out any sort of photo-taking device, and once we'd started in there was no stopping us. My steak was perfectly cooked with a divine brown sauce of some sort, and I don't use the word divine lightly! Alongside the steak were vegetables and a small salad, paired with a delicious Merlot that the waitress had recommended. Elise particularly enjoyed the carrots dipped in the brown sauce, and would open her mouth for another bite each time she swallowed. It was so good that we couldn't say no to dessert, so we followed it up with a chocolate mousse that was probably sent straight from the heavens on to our plates. Elise may or may not have sampled a tiny taste of that as well...the c'est la vie! mentality struck again. I didn't want her to miss out on the meal of a lifetime! We left the restaurant and walked back to the hotel vowing to return with our respective spouses in the future. If I say it out loud, it has to happen, right? In the words of the Terminator, I'LL BE BACK. So we never actually had more crêpes, but it didn't matter because we'd found something even better. We peaked at the very end, which is the ideal way to (un)plan a trip! We arrived home to a foot of snow, no power, a buried car, and several trees down in our driveway, but we were able to stay with my parents that night and power was restored the following morning. All was well, and best of all, we were reunited once again! We took a blurry selfie to commemorate the occasion. And with that, our international adventures were ended. À bientôt, Paris!